Bruce contacted us about a month ago about making a new website for him. He ordered his domain name through another company and setup a one-page website. However, he was not happy at all with the site and felt that he could offer a lot more on his website. After getting the materials from Bruce that he wanted on the site, we got started and put together a very colorful and inviting website for his customers to see. He has been very pleased with the work that we’ve done – and even had us do some video editing for a video he had. We’ve now completed the website and are helping him with SEO and even pay-per-click advertising for his site. We appreciate the business from Bruce at Pensacola Beach Sailing Tours! 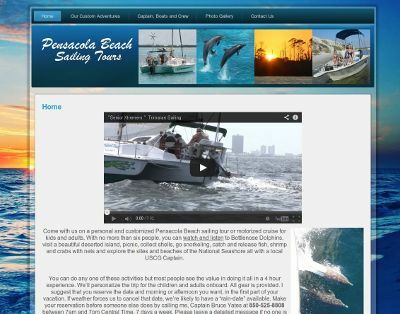 Bruce’s site is at pensacolasailingtours.com.